Over the next couple of months, we have arranged a number of events to publicise our two recently released books. These events give you the opportunity to have a chat with us, meet some like-minded Arsenal fans but, more importantly, get your books signed by some proper Arsenal legends. Andy, Mark and Josh signing the Complete Record book with Charlie George at both locations. Andy and Mark signing the Royal Arsenal book with Bob Wilson. Andy and Mark signing both books, at special AISA membership prices, with Liam Brady. Also signing will be our Royal Arsenal editor, Tim Stillman, and fellow writer on the Complete Record book, Josh James. The whole event will be hosted by the legendary journalist – Paddy Barclay. Andy will give a talk on ‘Arsenal at Plumstead’, followed by a Q&A with all three authors and signings of the book. A bit like buses you wait for a book to come out and two turn up at the same time. Which is why we have been quiet on this site, as we’ve been so busy researching, writing, editing and compiling Arsenal History from all angles since the start of the year. 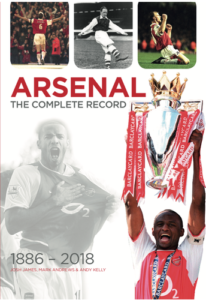 Arsenal: The Complete Record is available in two varieties: Standard edition and Deluxe edition and also is available with an optional limited edition “Invincibles” or “Anfield 89” Subbuteo set. To be honest we assumed any new revisions of history would be the sole domain of the Royal Arsenal tome, and as you read that story you will see how the Plumstead era history has been be-devilled by mythology, which we have successfully debunked. 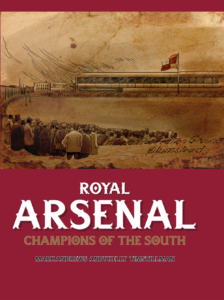 However, much to our surprise we have found a previously undiscovered major fact about the only promotion that Arsenal achieved in 1904 which appears in the Complete Book. It changes the very identity of the manager who was in charge when Arsenal achieved their first and only promotion to the top flight. We’ll be publishing a blog in the next couple of days which explains how and why. Comment and critique of the Royal Arsenal book that was preliminary issued in June 2018 has been excellent thus far. There’s probably 4 or 5 truly fantastic all time Arsenal books. But just finished this newly released book on Royal Arsenal. Absolute definitive tome with a lot of researched info that’s never been researched previously. A must for fans on the history of the club. Finished reading this superb book at the weekend on the origins of our great club.The detail is incredible @Gooner_AK & @RoyalArsenalMRA must have put untold hours researching it & @Stillberto has done an excellent job editing it. A must for any fan who loves our history. Fantastic read and brilliantly researched. Great Idea, Coming to a pub near you? Maybe Arsenal Football Supporters Club clubhouse? Hi Steve, we’ll be at the Arsenal Supporters’ Clubhouse on 3 November with Bob Wilson.